Our products are designed with a combined experience of 30 years working in the theatre automation industry. Based on real-world experience and our unique, hands-on knowledge of the demands on a production. That’s why we have leveraged some of the latest developments in industrial motion control, like One Cable Technology and fast industrial networking infrastructure. This enables us to build equipment that is not just incredibly flexible, to meet the varying requirements of different productions, but also quick and light-weight to setup and install. The Rack[Four] allows the connection of four motors, which can power an almost limitless variety of stage machinery. Typically we use high-performance servo motors with "One Cable Technology". Motor power, encoder and brakes all run down a single cable, which means in many situations you only need to run one cable for each axis of motion. This helps simplify installation and save on fit-up time. Should more capabilities be required powered EtherCAT ports give the option the adding of an IO[Box] which allows you to extend the functionality by adding extra inputs and outputs. There is also a connector to attach external brakes, should they be required. A front panel allows manual control of each axis and displays diagnostic information. Our desks allow you to program and control movement during a production. We current supply two variants of our control desk, each with a large touch screen interface which makes programming and cue management simple. A joystick is provided for manual control and speed override. Desk[One] is our single playback desk, for small to medium sized productions. Desk[Three] is our three playback desk, for productions where more complex control is required. Both desks run our Motion control software. 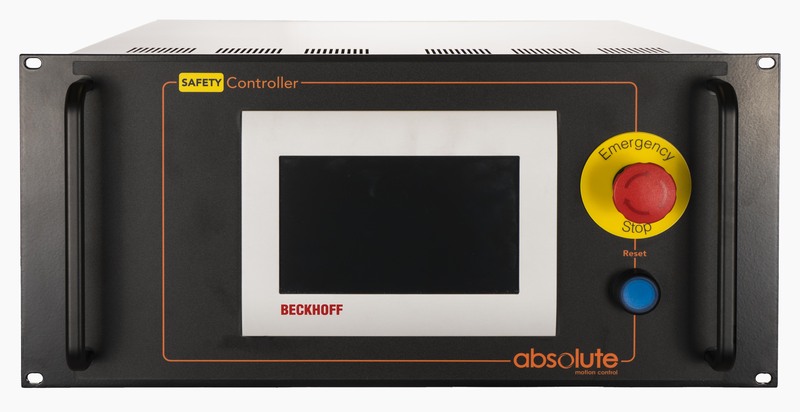 Our Safety Controller enables the connection of multiple control racks, linking everything together to create a global emergency stop and safety system. A touch screen display allows the user to monitor the status of all the devices on the safety network. Stop Boxes can be connected to the Safety Controller, which enables you to add several "field' emergency stops. Our Stop[Box] has an easily accessible emergency stop button on the front. There is also a port for additional inputs to extend the safety capabilities of the system. For example, you could use this input to easily add an enable switch to the system. This prevents motion without a second person acknowledging that is it safe to do so by pressing and holding an enable button. This can work globally, or on a per axis basis. Other accessories can also work with this port, such as safe edges and light barriers, to help manage the safety requirements of a production. We think that a modern theatre automation system should be infinitely expandable, that’s why adding extra capabilities to our system is as simple as plugging in a box! Our IO[Box] can interface with limits, proximity sensors, interlocks, additional encoders, pretty much anything you can think of. There are also control buttons which can be used for maintenance or during fit-ups.